The tragedy of Gallipoli, 100 years ago, was commemorated by the ringing of the Gallipoli Bell, as it has been rung every Sunday since it was bequeathed to the church by Lt Col. John McNeil of Kippilaw, who was killed in action there in July 1915. The July 19 service begins at 9.30am. Highlight at morning service on Sunday was a slide-illustrated talk by Margaret Blyth following her visit to Malawi to visit the work done by her late husband John’s Friends Together Trust. He died last September. The John Blyth Malawi Fund continues to change the lives of his “sons and daughters” in Malawi, she said. It is hoped to develop a sense of “family” and mutual support among John’s Malawian “family”. During his illness, he heard of Lucky and Cynthia’s own plight and told them to seek and start life-saving treatment, the cost of which was met by donations from church-goers and at his funeral service. Melrose and Peebles presbytery is planning a youth visit to Malawi in July 2016 – details from the Reverend Jim Wallace, 52 Waverley Mills, Innerleithen EH44 6RH, or email jimwallace@121btinternet.com. Sunday’s Bible reading was performed by Jo Lawson, while Dorothy Howden was at the organ. Ruberslaw Church, in association with Hawick Archaeological Society, is marking the 100th anniversary of the death of Denholm-born Sir James Murray, founder of the Oxford English Dictionary, on July 26 with a service in the village church at 11am, followed by a commemoration at Murray’s birthplace at 12.15pm. An exhibition of his life and work will run in the church from from 10.30am-3pm. The July 19 service at 10.15am will be conducted by the Reverend Julie Woods and members of the worship team. The church is hosting a concert at 7.30pm on August 3 by St Peter’s Choir, St Albans, Hertfordshire. Donations welcome on the night. Earlston Community Council will hold its next meeting in the primary school staffroom today (Thursday) at 7pm. The public are invited to attend to raise local issues. Dorothy Howden led Sunday’s congregation in music and read Bible passages from Revelations. The Reverend Elspeth Harley had invited Margaret Blyth, from Caddonfoot Church, to tell of her recent trip to Malawi. Margaret and her late husband, John, had been involved in helping the people of that African nation for several years, and when John died a trust was set up in his name to help continue their work there. Margaret explained that although Malawi is a beautiful country with lovely people, they still have lots of problems – lack of opportunities for education, illness, shortage of medication, no welfare state nor pension scheme. In the south of the country, hit by severe flooding at the beginning of the year, people are starving. Through John’s trust, Margaret and her family have helped many youngsters in Malawi get an education, provided health care and assisted people to set up in business. Next week, from July 20-24, it’s Trinity’s turn on the foodbank rota. The Kidz Klub is on holiday for summer, but children are welcome to services and there are crèche facilities available for those under three. Carol Byers is the only full-time employee at the Haining Charitable Trust in Selkirk, she told members. Andrew Nimmo-Smith bequeathed the house and £1million for the benefit of Selkirk people and the wider public. She said the house was dilapidated and the full sum would be needed to restore the building. Following an appraisal of all the options available, the trust decided to set up a centre for contemporary culture with a gallery, café and artisan workshops. There are now six artist studios and six apartments in the courtyard area. A wide range of events now takes place, including craft fairs, exhibitions, theatre performances, and the grounds are being managed to improve access around the loch. Free fun activities are being held for parents and children who live in Galashiels. These take place on Saturday mornings and Wednesday evenings, with the first sessions on July 18 and 22. “Wild about Dads” is a chance for fathers and male carers to connect with nature and spend quality time with their child (newborns to aged five) and other dads. This takes place for six weeks between 10-11.30am in Langlee Community Woodlands. The first event is this weekend (July 18). Dads and tots should meet at Langlee Community Centre car park, be dressed for the outdoors and bring a snack. Meanwhile, every Wednesday, from July 22, a free evening activity club is taking place at Langlee Primary School. Organised by Borders Sport and Leisure Trust (BSLT), parents and their children (aged between five and eight) can take part in activities, including football, gardening, baking and a nature trail. These events are part of a year-long project co-ordinated by Langlee Early Years Centre and funded by the Big Lottery Fund. This was in response to a consultation undertaken with parents of young children in the Langlee area. Members had visitors from Germany and Poland at their latest gathering. Locals are invited to provide a cheering, capacity audience in Glendouglas Hall on July 24 at 7.30pm for the recording of Gary Forrest and his Ceilidh Band’s new CD. Entry is free and those turning up are asked to bring a raffle prize and their own supper. Tea and coffee will be provided, plus a bar. For more information, call John on 07803 951293. July 7 – N/S – 1, Mary Millar and Patsy Gilligan; 2, Michael Tuson and Bob Witherington; E/W – 1, Ken Auckland and David King; 2, Valerie MacPherson and Bob Francombe. President Mairhi Trickett introduced Elle Bunyan, from Selkirk, who is doing post-graduate studies in psychology and care. She is engaged in fieldwork among the slums and ghettoes of the Ugandan capital of Kumpala, part of the team at a 250-strong orphanage. Disease is prevalent – Elle has suffered from malaria and typhoid. There will be a Breakfast Song and Story service at 8.30am on July 19, with a service at St Ronan’s House at 4pm. July 6 – 1, R. Oates and S. West; 2, A. and R. Stewart; 3, M. Weightman and H. Long; 4, M. Allen and O. Whillans. July 8 – match-pointed pairs – N/S – 1, Val Johnstone and Mary Millar; 2, Dominic and Diana Alkin; 3 (equal), Joyce Thomson and Helenor Pratt, Alex Jeffrey and Lee Leeson; E/W – 1, Maureen Weightman and Helen Long; 2, Jean McLaren and Alison Ireland; 3, Mary and Jim Stone. July 9 – aggregate pairs – N/S – 1, Ian Watson and Georgina Hall; 2, Michael Horwood and Alison Ireland; 3, Brian Saywood and Sheila Urquhart; E/W – 1, Ken Ross and Jean McLaren; 2, Chris Anthony and Marion Miller; 3, Dorothy Graham and Lynda Douglas. Outgoing president Irving Stuart welcomed 25 members to the 31st annual general meeting in the Eskdale Hotel, where Harry Aitken was installed as president for the 2015/2016 session. George Whillans was made vice-president and Andy Little remains as secretary. Arrangements for the summer trip on August 19 to Dumfries House were finalised – there are still seats available. Following the meeting, the club was joined by members of the Friell family in front of the Town Hall to unveil a seat in memory of Willie Friell, the last founder member of the club. He was also a long-serving secretary and past president. Past president Irving Stuart thanked community councillors for their contribution to the money raised by the club to fund the seat, which replaces one fondly remembered by older club members. Following the unveiling, the party retired to the Eskdale Hotel for refreshments. Tributes were paid to Willie’s memory and vice-president George Whillans proposed the toast to “Absent Friends”. The next meeting of the club will be on September 2 in the Eskdale Hotel (10 for 10.30am). The local camera club is holding its annual exhibition in the Eskdalemuir Hub. After the closure of the gallery at the town hall, the photographers had to look around for a new home for the summer exhibition – and the old school at Eskdalemuir, which was converted, now has a café and other facilities, proving ideal. The exhibition runs until July 31. The Buccleuch Centre is launching its first season of live screening events, via satellite to the big screen. It begins with André Rieu’s Maastricht concert on July 18. Known as the King of Waltz, André performs every year in front of thousands of fans in his home town of Maastricht in the Netherlands. He will, as usual, be joined by his Johann Strauss orchestra and singers, along with special guests. On July 18, Melrose Historical and Archaeological Association will host a guided walk covering sites associated with the military action that took place in July 1526 when Walter Scott of Buccleuch challenged the Earl of Angus for the custody of the 12-year-old king, James V. The walk will visit Darnick Tower, where the young monarch watched the action from the battlements, and also the “Turn Again Stone”, believed to mark the spot where the retreating followers of Buccleuch killed the pursuing Earl of Cessford. The walk starts from Melrose Parish Church grounds at 2pm – free to members of the association and Battlefields Trust, donations from non-members appreciated. clean water for an entire village. Closer to home, following Richard Salem’s President’s Night, the club donated £250 to the Children’s Hospice Association of Scotland. In Melrose itself, members were involved in stewarding for the Melrose Festival and even found time to appear as monks at the abbey. Harrison Joseph Scott was baptised amid family and friends, receiving a candle lit from the church’s Easter candle, signifying new life. The July 19 service begins at 11am. Walks continue on Tuesdays and Thursdays from Melrose, and Sunday afternoons from Newstead. A reunion group of 16 is coming this week to add to the mix. Numbers are still coming forward for the Antonine Wall central section outing on August 8. The Glitz and Glam night at the rugby club on July 25 has been cancelled. A committee has been formed to create “Morebattle Archives”. Members are currently concentrating on fishing in the village. If anyone has information or photographs which they think would be of interest, they should contact Anne Brown at the village store. Morebattle is in Scotland in Bloom’s Champion of Champions category. 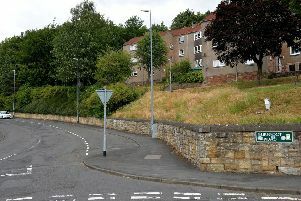 Judging will be on July 29, with a clean-up on July 24 at 7pm at the Toon Gate which villagers are urged to take part in. A coffee morning in aid of Guide Dogs for the Blind is being held in the village hall on July 18 from 10.30am. Copshaw Common Riding once again attracted a good turnout. It was thunder, lightning and torrential rain at the hound trail (puppies) for the tongue-in-cheek event, which has people on bicycles instead of horses. But by the time chairman Gary Cuthbert stood on top of the fountain in the square to welcome everyone, it was cloudy but dry. Tub Elliot arrived with his Left and Right-Leg Man and Woman, Peter Irving and Gillian McGimpsey, and his first duty was to present the hound trail cup to Barbara Telford from Carlisle and her pup, Tate. The prize for best-dressed window was won by Copshaw Kitchen. The best-turned out young supporter on their bike was Reece Young, and the prize for best-dressed adult went to the group called Jock’s Dykers. The other youngsters’ prize was won by seven-month-old Lauchlan Brannan. Garry Cuthbert gave his rendering of Copshaw Common Riding Fair and his wife, Vicky, recited a poem. Martin Pearson sang his version of the Common Riding song. It was decided that the money usually given to local causes at the New Year would instead be given out during the morning – £500 went to Newcastleton and District Community Trust, which was received by Barbara Elborn; Libby Kennedy was handed a cheque for £500 for Polysport; and Newcastleton Youth Project got £250, received by Zach Milner. Tub Elliot then collected the flag and, along with his mounted followers and supported by Flake Grace Elliot, set off on his bike on the chase for the Mick Rick Memorial Tankard. It was up the stiff climb to the golf club where there was a social gathering. After various unusual ceremonies throughout the morning, the riders headed down the main street to Liddleview Park for the garden party, with sports for adults and kids. In the evening, Jedburgh Pipe Band marched to the village hall for the opening of the festival concert, and then at the conclusion returned with the Tub to the fountain in the square where he handed back the flag. Entries for the Oxton Garden Competitions should be given to a committee member (718633 or 750654) by July 20. There are four classes – vegetable gardens, ornamental gardens, tubs and window boxes, and hanging baskets. They will be judged, unannounced, during the last week of July. The next service in Traquair Kirk will be on July 26 at 10.30am. The Kelso Laddie makes his annual visit to the village on July 18, arriving at the war memorial about 11.15am for a short ceremony conducted by the Reverend Ian Clark. Then the Laddie heads to Kirk Yetholm for a welcome speech, followed by lunch at The Plough Hotel in Town Yetholm. Before leaving the village, the principal and his followers will dance the traditional reel outside The Plough Hotel. John Lamont will be holding an open surgery in the Wauchope Hall at 4.15pm on July 21. Weekly coffee mornings continue each Wednesday at 10.30am downstairs in church. Sunday services for the rest of this month will be in Morebattle Church only at 11.15am. Tickets for the Robyn Stapleton Trio concert in the Wauchope Hall on July 25 are on sale at the village shop, or contact Susan Stewart (01573 420231). And on August 27 at the same venue, Kathryn Joseph (Scottish Album of the Year 2015). Tickets for this event will be on sale at the shop from the end of July.